Everything about this claim, of course, invites scepticism. The Tussaud Memoirs are transparently unreliable. According to David Binton, the story that likenesses were made after execution is first mentioned in Tussaud catalogues only 1822 when the heads were moved from the main exhibition to a separate early version of Chamber of Horrors. The claim was then elaborated in the Memoirs, first published in 1838. In the beginning (1803 catalogue) they were simply exhibited with biographical information but no lurid details. There is no reference among the copious official records of the Revolutionary government. ﻿It is not easy to make a death mask from a guillotined head! "In order to create a death mask, there was a specific process: First, the deceased’s hair and eyebrows were covered with clay or oil so that the plaster would not stick to it. Next, plaster was ladled over the head of the individual. Sometimes this meant propping them up into a sitting position as seen in the picture or carefully doing it lying down. Next a thread was placed from the bottom of the chin to the top of the forehead in this thinner plaster. Fourth, thicker plaster was added and the string was removed to create a mask in two halves for easier removal. Once hard, the mould was removed, and then placed back together. Before a mask could be made, the plaster cast was cleaned and then filled with modelling clay or new plaster to make the mask" (Katy Meyers, "Preserving the face of death")"
This photograph of 1908 shows the corpse propped into a seated position with two assistants hard at work. I wonder how easy this would be with a severed head? 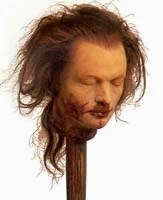 (Not just a picture-book image but an actual decapitated person). It is a common misapprehension, again encouraged by the Memoirs, that Curtius and later Madame Tussaud herself habitually modelled "from life". Respectable sculptors like Houdon and David d'Angers certainly worked from plaster of Paris life masks, but wax artists usually had to be content with clay models. (Kate Berridge, p.55) The early miniatures and elaborate tableaux of Curtius relied more on context that exact representation, with an emphasis on novelty and quick response to changing fashions. 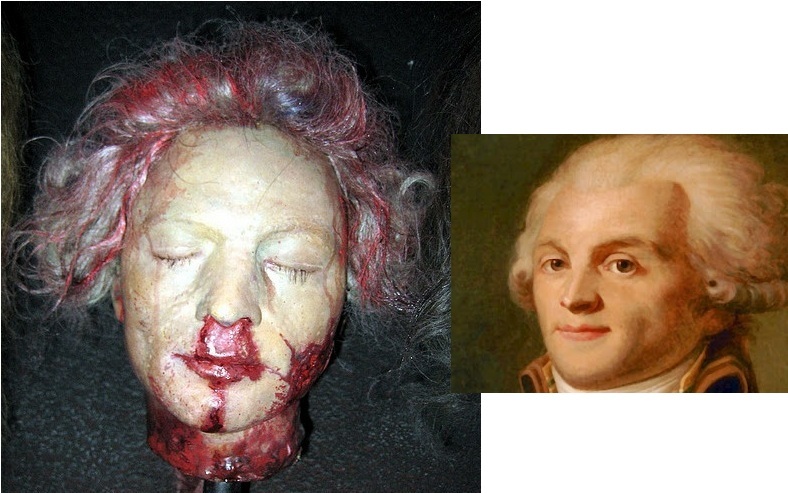 The jaw of Robespierre shows no sign of injury (beyond a few drops of painted blood). 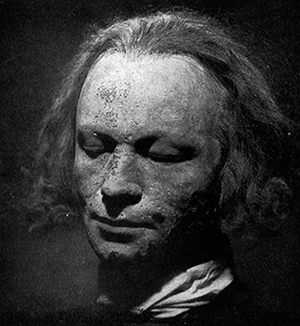 after he had been guillotined, July 28,1794"
Was there a life mask of Robespierre? Presumably Collot d'Herbois and Rossignol have long since been melted down.......? 2. A life mask of Robespierre by Houdon is known to have once existed, a preliminary for a statue that was never begun; David d'Angers later employed an assistant who had helped to create it (Poulet, p.312). There are hints of some sort of relationship between the waxworks and Houdon - the Romance of Madame Tussaud's makes the unlikely claim that Houdon had once worked for Curtius. The wax Voltaire, which survives, is so finely cast and so close to Houdon's statue, that one wonders whether Curtius had access to Houdon's mould (though his artistry should not be underestimated). It is hard to put these clues together in any sensible way, but they do at least suggest that a life mask may have been potentially available. It might be more productive to make comparisons between the mask and the 3D bust by Deseine. The Carnavalet portrait is a copy, or even a copy of a copy of the lost Gérard. There's something not quite right with the proportions if you compare it with the Gérard sketch and with the portrait from a similar angle at Versailles, in the black coat: a problem with the drawing, which I think comes of it being a copy rather than done from a live model. Are there any profile photos of the masks, do you know? Because he has a very distinctive profile. Thanks. I've tried using pause to glimpse it when it's more side-on, but am not sure… Yes, the nose is fairly sharp, but I'm not sure it's got that very distinctive pert look he has in all his profile portraits. This is an attractive mask (even with the pockmarks, the sitter was clearly a good-looking chap) – much nicer than the dreadful recent 'reconstruction' suggests – but I'm not 100% sure… Do you have an email address I can send screencaps to, please? Sure - contact me via Google Hangouts or Facebook and I'll send it to you. My suspicion is that it's not him, but that Tussaud took a life-mask from a model who resembled the portraits then available in engraving. The proportions aren't quite right in comparison with the physionotrace or the Deseine bust: the face is wider and shorter, and the nose lacks the characteristic shape. The physionotrace has to be taken as a 'master' image because of the method.